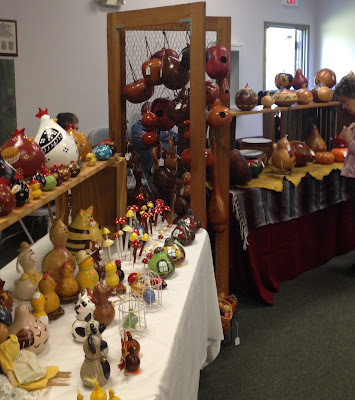 The West Central Ohio Gourd Patch is excited to announce their 3rd annual Spring Gourd Show. It will be held on Saturday, May 19th from 10am to 4pm at the Darke County Shawnee Prairie Preserve in Greenville, in conjunction with their Spring Native Plant sale. The events are free and open to the public. During the show, handcrafted gourds will be available to purchase from local artisans, along with dried gourds and plants. Come meet the talented artists who will gladly share their knowledge of their craft. It will be a wonderful opportunity to see the many different artistic techniques that can be implemented to a gourd. Some carve and wood burn them, while others may cut, paint or dye them different colors, or use a combination of techniques to create a unique piece of art. With so many different sizes and shapes of gourds available, the possibilities of ideas are only limited by your imagination. While gourd plants will be available for purchase, any questions you might have about planting, growing, harvesting, drying, and cleaning a gourd will happily be answered. If you are looking for a unique item for a special someone or just for yourself, or curious to learn more about gourds, please come check us out. You might be surprised at what you may find and learn!